A combination of capital constraints and the carry trade gift from the ECB is providing little incentive for the eurozone banks to make significant new credit available to either the consumer or the corporate sector. Even with all the risks, sovereign credit is generally preferable from the risk perspective than the consumer or corporate exposure in the same countries. A credit officer is far more likely to approve a 2-year Spanish government bond than loan to a Spanish corporation or a pool of Spanish mortgages. These tight credit conditions are expected to persist for some time, and combined with fiscal consolidation, will put significant downward pressure on the eurozone GDP growth. Fitch: Tightening financial conditions, falling confidence and new fiscal austerity measures have led Fitch to revise down its forecast for eurozone GDP growth to just 0.4% in 2012, from 1.6% in 2011. Fitch, together a number of other economic forecasters predict slight to no growth for the euro area nations. The consensus is for roughly zero growth during 2012. But some well respected research economists see a much more dire situation. Capital Economics (CE) is one of those. CE by their own admission has been a good 100 bp below consensus for the eurozone 2012 forecast each month this year. 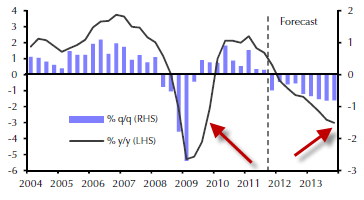 Their latest forecast is a true "double-dip" recession in the eurozone, with GDP contraction levels that parallel those of 2008. 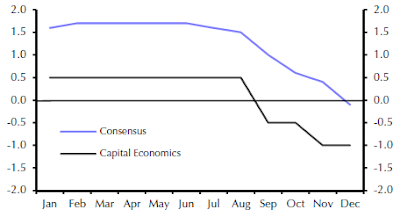 What makes this forecast particularly bearish, is the expectation for 2013, with continuing economic deterioration. Part of the reason for such gloomy prediction is CE's view that the eurozone will not exists for much longer in its current form. Our assumption is that a limited form of euro-zone break-up will commence in 2012, with the exit of Greece followed by further small country departures in 2013... But a bigger form of break-up, perhaps involving Italy, would cause much greater damage. This is akin to a "black swan" scenario and would send shocks across the global economy. Let's hope the reality is closer to the consensus.